I've been asked to make a card for a lady who has just become a grandma, to welcome her grandson to the family. Here is what I came up with. I had a great day shopping at Ally Pally on Sunday....spent quite a bit, but that's what it's all about. After hearing so many people talking about promarkers, I took the plunge and bought myself some. Why haven't I bought them sooner? They're fab! 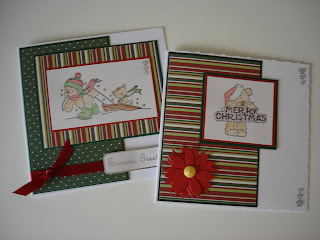 Here are a few cards I made using a gorgeous stamp I also purchased from Lily of the Valley and coloured in with the promarkers. 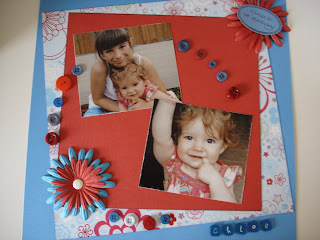 This layout features my daughter and her little cousin at a family BBQ on a lovely sunny day.......those sunny days seem so long ago now. I'm a sucker for anything cute, and I love the Daisy and Dandelion range, so of course I just had to buy myself one of the cute cuddly Daisy toys on my shopping trip. I thought I'd better start thinking about Christmas, as I always leave it to the last minute. I was out shopping last week and happened to be looking at cardmaking magazines and saw that Octobers edition of Cardmaking & Papercraft had a lovely set of Christmas stamps absolutely free with it. Of course it would have been rude to have left them on the shelf, so I had to buy it. 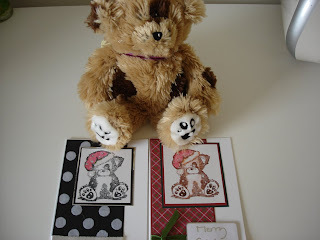 These are 2 of the cards I have made with the cut little stamps. As the weather has been so blustery today and the council have dug up the front road so you can't go anywhere, it's given me a big excuse to sit and craft. These 2 layouts are from our visit to Banham Zoo last moth for Aimee's 10th birthday. My layouts are usually quite simple but I think I've gone a bit overboard with the owl layout. I think I've shocked myself this month as I've already done Lesley's challenge on the Craftswap forum. The challenge was 3's, and not only have I done one page, but I've done two. The phoo's are of my daughter Aimee enjoying herself in Ibiza last month.